Tried and true, these are by far my FAVORITE muffins! Add a little spread of cream cheese and ohh! I’m in heaven! Obviously I’m not a nutritionist, but for the amount of berries and nuts in here add a little bit of healthy-ness to your daily routine, and make for a great morning snack. Now, if you layer on the cream cheese, maaayybbee it’s not so much on the healthy side, but that’s beside the point. 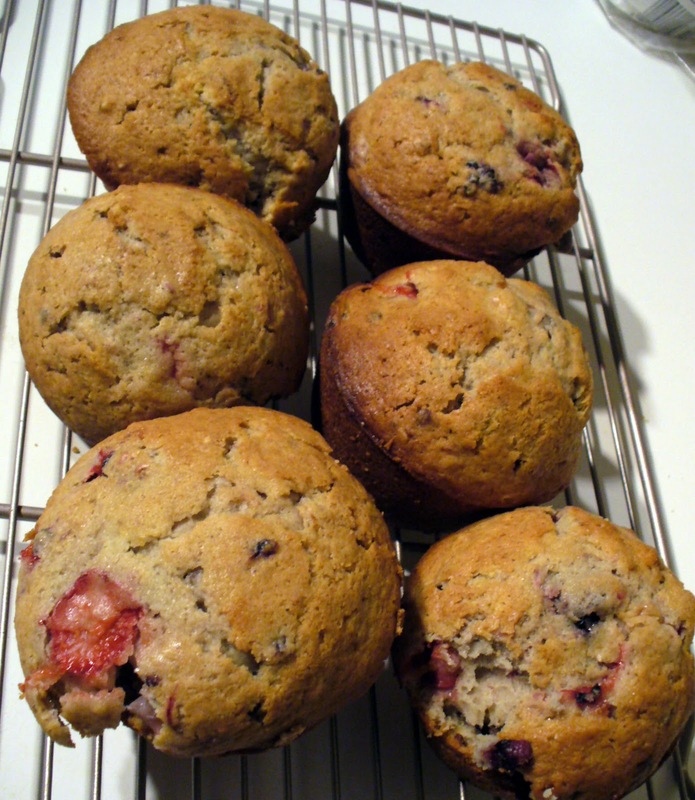 The berry and nut combination can be used with whatever you have on hand. I’ve made it with frozen berries, like the ones for smoothies, fresh berries, freshly frozen fresh berries, everything! Nuts, whatever YOU like and you have on hand works! This is just my favorite combination! · 1-2 good handfuls of berries of your choice, washed. No need to defrost berries that are frozen. · 1 cup or so of your favorite nuts ground up. Unsalted almonds and walnuts work great! 1. Cream butter, shortening and sugar until well mixed. Add eggs, stirring after adding each egg. Add extracts, mix well. 2. Combine the flour, baking powder and soda, the salt and then add to the creamed mixture. Once blended, than slowly pour in the milk. 3. Once all of the main ingredients are mixed, stir in the ground nuts, followed by the berries. You want the berries to be the last things in so you can gently fold them in and not break them too much! 4. 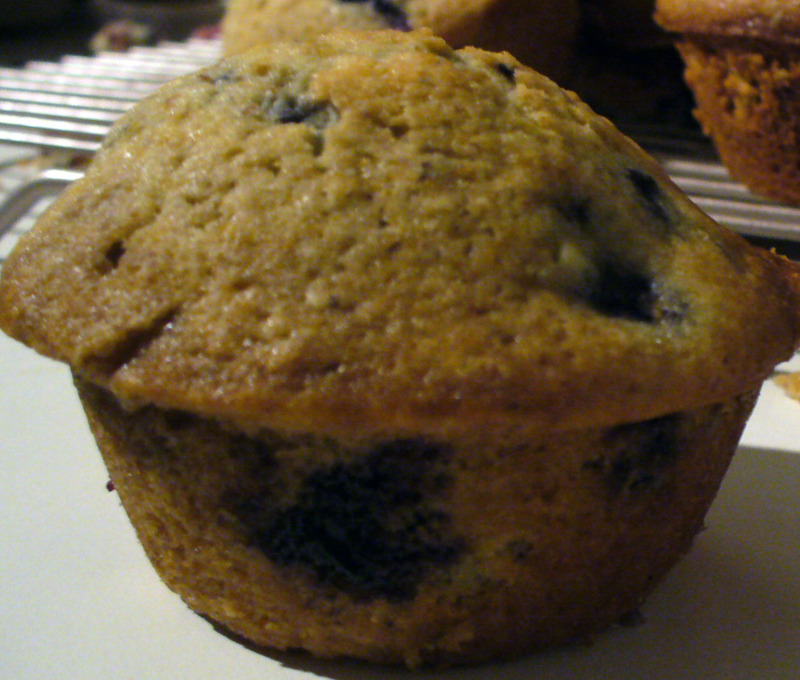 In muffin cups, preferably lined and sprayed, bake at 350 degrees for about 25 minutes. This cook time varies depending on how many berries you use. I always suggest taking a quick peak 5 to 10 minutes ahead of the scheduled completion time. 5. Serve warm or chilled! These freeze BEAUTIFULLY! I pack them in individually baggies and take one out in the morning before I head out for the day, and by mid-morning I have a yummy and healthy snack! 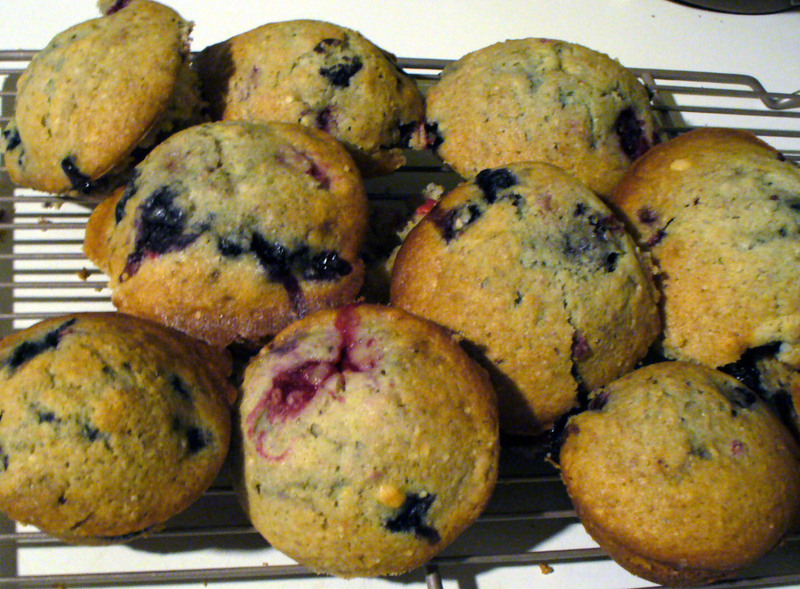 This particular batch tends to make about a dozen to a dozen and a half muffins depending on how large your tins are. I would assume you could probably make this into a loaf if you wanted, but I haven’t tried it yet, so me know if you do!! I hope you give this recipe go! It is one of my favorites! mmmmmmmmm these look SO GOOD! when I moved I accidentally left my muffin tins at my old apt, so I have been muffin-less for so long! time to buy a new one?! yes. you should! these are totally worth it! dont forget the paper liners too!